This seminal case by the New Jersey Supreme Court identifies minority oppression as the frustration of a shareholder’s reasonable expectations. A court may order the compelled purchase of a shareholder’s interest as a remedy for shareholder oppression when it is the only practical alternative to judicial dissolution. 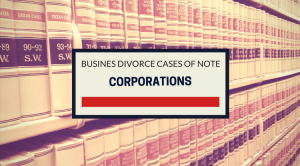 The minority shareholder seeking to force the purchase of shares must show a connection between the oppressive conduct of the majority and the minority’s interest as a shareholder. Facts: Partners Resnick and Berkowitz formed successful company. Members of both families were employed in the business. When Resnick died, his shares were distributed to family members, including his daughter, the plaintiff Brenner. Relations between the two family members soured and Brenner’s son was fired. Brenner alleged illegal and oppressive conduct.